Chin, onnum puriyela but your wordings is awesome. Felt like finish reading a brilliant novel. Next 'hat' Novelist? :) Big smile.. thats what your post gave me this time. You are trying to convey something.. poetically. But i guess you are growing less expressive. People who knows you personally can comprehend better. In the beginning of this year i reached your blog thru twitter. Reading it since then and I found the number of your posts are halving every year. (Roughly since 2009). Growing busy? or..? 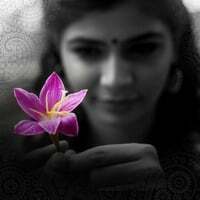 Poetic Chinmayi, but don't know what you are trying to convey. Whatever it is may it is only for good. Take care and Keep Smiling. Somehow I felt carried away thru the lines of this blog. Eventhough I read that in English, it always went into my neurons translated into tamizh, hope the words had magical touch into it. Looks like you are reminded now and then of your Board Exams you wrote a few years back :) On a serious note, transitions happen at every stage of our life and we begin to get a more mature outlook. i do not know why but this article of yours flashes the Uttrakhand flood tragedy! cobalt blue defines the flood/water and the words define people to me! most of them washed away in the pot of ink which fell from no where and the words did not expect this from where it was originated!